Morro Bay Art Association is proud to present Mandy Covish, Elementary School Teacher for ongoing art classes designed to reach children between Kindergarten and 6th grades. Mandy has taught primarily 2nd and 3rd grade levels in the Merced City School District and Clovis Unified School district. With her recent relocation to the Central Coast she is eager to begin teaching on the Central Coast. Mandy taught GATE students (Gifted and Talented Education) for seven years, emphasizing on the arts as a vehicle to promote higher thought processes. She worked as the Reading Intervention Teacher and successfully implemented a fluency and comprehension program through Read Naturally, Soar to Success, Seeing Stars utilizing appropriate leveled books for grades K-6. Students will be studying the ARTS, Geography, and Culture of Japan through the arts, literature, and videos (technology). Students will be creating Japanese Fans with ink & acrylic paints, Watercolor Cherry Blossoms, Japanese Samurai with crayola markers, paint & paper, and Sushi Collages with various types of media. 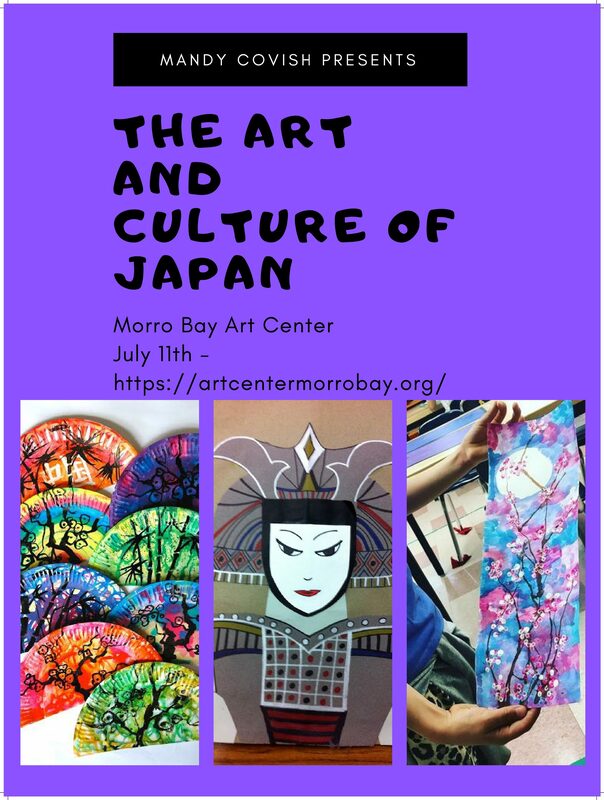 ADDRESS: 835 Main St., Morro Bay, CA 93442 , TEL: (805) 772-2504 | EMAIL: mbaa@artcentermorrobay.org.